Ever since forever, well at least since I've been a ham, I have had the obvious goal of having a real big tower and a huge beam and a billion watts to send to the distant corners of the globe. Well, I recently took one small step towards that dream. 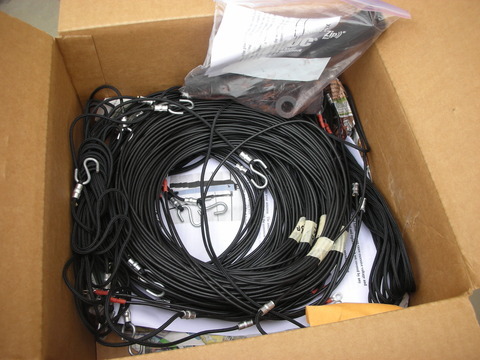 The week before Dayton, I put my order in for an NA4RR Hex Beam. There are lots of commercial vendors of hex beams including DX Engineering, K4KIO, and others, but NA4RR's hex beams are by far the cheapest at just $450 plus shipping, and I think Roger's are the only ones that come with the 6m element standard. It was a no brainer for me. I had some correspondence with Roger before I ordered because I had planned to buy something at Dayton and wanted to see if he'd be there. Unfortunately he wasn't going to be but he offered me free shipping as a Dayton Special, so I pulled the trigger then and there. This took a little wind out of the Dayton sails but that's all right, I was getting a great deal. Roger ships via FedEx in 2 boxes and they both arrived on the Monday after Dayton (I had them hold on to it until I got back). I didn't take any pictures, but another local ham actually ordered the same time I did and took pictures of his as he unpacked it and built it up. I built mine in my drive way which is only 1 car wide and the antenna spilled over into the neighbor's driveway so it is a lot bigger than I thought it'd be but luckily I got it done before she came home. It went together very easily, just routing wires and ropes. The whole thing weighs about 30 lbs when it is complete, which isn't heavy but with such a big wingspan, it is a little unruly. Even so, my wife was able to help me lift it up onto my roof so I could take it to the back yard to place it on the mast. 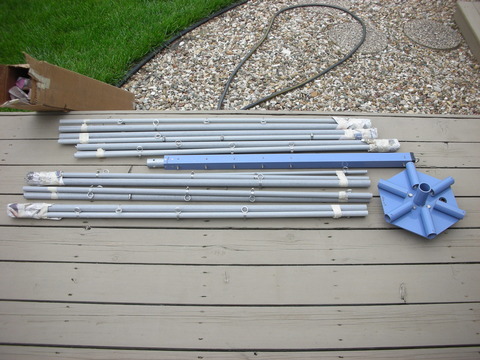 Another local ham had 2 aluminum push up masts he was giving away so I volunteered to take those off his hands but I wouldn't be able to get them until a week or so later so I dismantled my fiberglass mast down to the top of the pergola over my deck and set up my hex beam on there for the mean time. This put it at about 16 feet at the base. I also hooked up the small AR-303 TV rotor I picked up for $30 at the pre-Dayton junk fest at work the week before. The whole project took maybe 3 hours including 2 trips to the hardware store for bolts for the rotor. Before I knew it, she was on the air and even at 16 feet, I could easily see the benefits of the antenna. I pointed the beam at a guy coming in about 10 over 9, then turned 180 deg away and he dropped down to S7 or so. This hex beam design has an advertised front to back ratio of about 20 dB and that is just about right by that test. Pretty incredible. In the first 4 days of having the antenna up at just 16 feet, I worked some 15 DXCCs including some completely new ones! My beam at 16 feet. 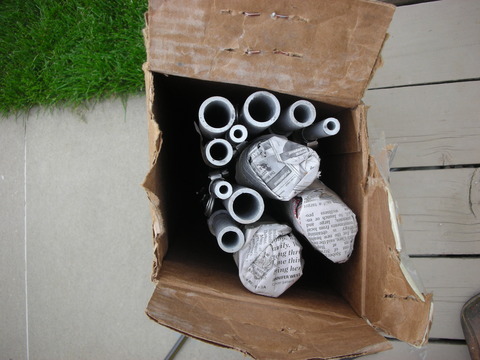 The next week, I went out to get the aluminum masts the day after Memorial Day - a paid holiday for me! I got to work putting it up all by myself - not something I would recommend! 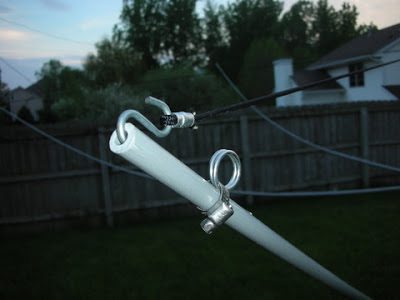 My fiberglass mast didn't have a very substantial guying arrangement, just a couple of ropes tied off to the base of some fence posts and the pergola. This worked just fine but it wouldn't be sufficient for the added weight of the mast and new antenna. I picked up 3 40 inch screw in guy anchors for this setup. These anchors are really slick, you just twist them into the earth at an angle and they can stand up to thousands of pounds of pull without problem. At just $7 a piece, there a lot cheaper than concrete footings and all that nonsense. They do take a little bit of work to drive in but its a small price to pay for the piece of mind. So I replaced the fiberglass mast with the aluminum one in the same spot. Conveniently, I can sit on top of the pergola at about 12 feet and work on stuff without a ladder. I just put a 4x4 sheet of ply wood on top of it and I have a nice area to stand and work without too much fear of falling. Still, it took a few hours of hammering and liberal application of WD-40 to get the mast sliding and rising appropriately. Eventually I did get the whole shebang up to the fully extended 30 feet, carefully got down off the pergola, tightened the guys and went to the shack to test it out only to find the stupid rotor had decided it didn't want to turn anymore. D'oh! I knew what had happened; while I was lifting the mast, I was sitting on the rotor cable and I must have pulled one of the wires out of the bottom of the darn thing. After a few minutes of trepidation lowering the mast, sure enough, one of the wires had come out. I fixed that and we were back in business. Of course the first night I get it up all the way, we have an incredibly strong storm blow through. They were saying 80 MPH wind gusts, but as I sat at the back door watching my poor helpless antenna take the wind, I grew confident that it would be OK. It took the wind without any trouble at all. So it has been at 30 feet for 6 days now with even more DX worked. Since I put it up, I have now had 35 DXCCs worked, including some incredible new ones like Kuwait, Kazakhstan, Moldavia, and Niger. 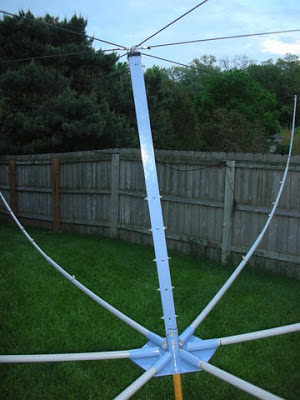 I am incredibly impressed by the performance of this antenna and I highly recommend it to those of us with small lots and cost restraints. Now I must comment on one little hiccup encountered in all of this. Sometime in the first week, the antenna had a seemingly random swing in SWR on a couple bands. Before it was a good match below 1.5:1 on all bands without a balun and purely flat 1:1 with one installed. But sometime during the first week, the SWR on 20, 15, and 6 jumped considerably. 20 and 6 remained below 3:1 but 15 jumped up over 5:1. I shot an email off to Roger and we discussed some possibilities and I did some testing but everything checked out. I had hoped things would clear up on their own, thinking it was water related or something but nothing seemed to help. Roger quickly suggested that he send a new center post and have me return the original one for failure analysis. Of course I took up that offer and the new center post arrived on Tuesday. I didnt look at the center post to see how ot was constructed so I took the opportunity to check it out. 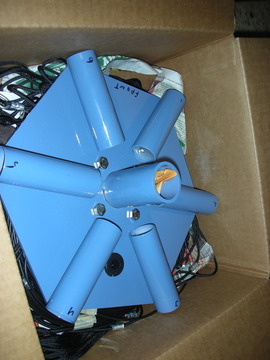 The inside of of the post is a square rod that is isolated from the outer rod and connected to the one side of connectors. It's a interesting design, but I'm not sure where anything could have gone wrong to cause the SWR problem. We will see if it helps. I took the mast down again (this is getting easier and easier...) and replaced the center post from the top of the pergola. This was no easy feat now that all the wires were attached to the center post. I figured out a way to get the old post to sit still while I moved the support ropes over to the new one and had no problem. I noticed on the new center post that Roger had marked which side was the front. I'm not sure but maybe this had something to do with the SWR problem. Once the new post was in place, I put the antenna back on the mast and ran to the shack. Sure enough, SWR now showed satisfactory on all bands! Whatever the problem was, it seemed to be gone. I went back up and sealed up all the new connections and got the antenna back up at 30 feet and everything still looks good. We'll see if it stays that way. Overall, I can't complain one bit about this antenna. It is really great. Even with the severly compromised conditions we've been having lately, it has performed beyond my expectations. I highly recommend a hex beam for anybody with a small lot and a budget, and specifically the NA4RR offering: it's a great value and Roger's customer service is perfect.